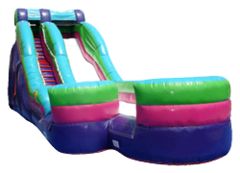 Have fun on this awesome slide with obstacle pillars on both ends! Climb up the cool rock wall on one side and slide down on the other. Designed to run two people at a time. 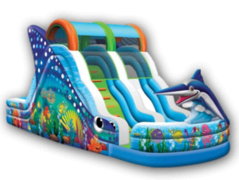 Kids of all ages will have a blast with this wet or dry slide. Used as a water slide in the HOT Summer months, this has an impressive 10 foot tall climb and slide, where your child will land and splash in our detatchable pool! At 18' high, this slide is almost as tall as a 2 story house! Set up indoors in your church or school gym! Our awesome slip-n-slide with a splash pool is great for all ages! Grab a friend and see who can slide down to the pool the fastest! Perfect for backyard parties or corporate events. This two-lane slide features a splash pool at the end. At 33' long, this unit provides tons of fun for your guests. 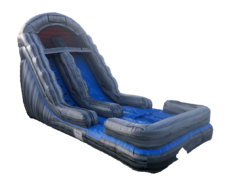 The Ripcurl Wet/Dry Slide with landing platform is by far our most popular wet/dry unit. 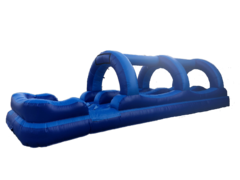 With it's 14' climb and slide with ripple, you are sure to get a RUSH! 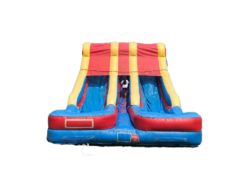 This slide is 40'L x 14'W x 17'H and can be rented out wet or dry! Set up indoors in your church or school gym! Water hose is not supplied by Jumpers 4 You. Please ensure your hose will reach to the setup location. This unit is 600 pounds - we cannot go up steep inclines or stairs with this unit. A clear and direct path to the final delivery spot is required. This unit requires a continuous water supply for best results. Do you want to have double the fun? This Double Lane water slide will do it! Great for schools! 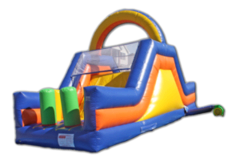 If you have an event with a lot of kids, this unit will get them through faster - which means they will have more time for FUN! This unit requires two blowers which means we'll need two seperate 15amp outlets for this unit. This is a VERY BIG unit. It will NOT FIT through most average gate openings. If you have an extra wide gate, double gate, or NO gate, this unit will go into your backyard -- provided there is NO HILL from the front to the back. This unit weighs over 600 pounds and cannot easily be pushed up even the slightest incline, preventing us from setting it up in your yard. If we cannot drive to the final destination, or you are not sure if it will fit, please call our office to consult with us prior to reserving this unit! Once you have paid the deposit, it is non-refundable even in the event that we arrive at your location and determine that the unit is too big, or the conditions of your yard (or getting to it) are not conducive to a safe setup for our staff. Depending upon your location, we can do an on-site survey prior to the reservation to ensure it will fit. 402-578-4123 and ask for Brian. Do you want a unit that is going to WOW your guests? This Marlin splash slide will do it! At 50' long, this is our biggest slide. It's 2-in-1 with two slides and continuous fun - enter and climb up the front side and slide down the back into the splash pool. Then climb up the back and down the front to the landing zone and exit to the left or go to the right and do it again. This colorful unit will definitely be the talk of the neighborhood at your next event! This is a VERY BIG unit. It will NOT FIT through most average gate openings. If you have an extra wide gate, double gate, or NO gate, this unit will go into your backyard -- provided there is NO HILL from the front to the back. This unit weighs over 700 pounds and cannot easily be pushed up even the slightest incline, preventing us from setting it up in your yard. If we cannot drive to the final destination, or you are not sure if it will fit, please call our office to consult with us prior to reserving this unit! Once you have paid the deposit, it is non-refundable even in the event that we arrive at your location and determine that the unit is too big, or the conditions of your yard (or getting to it) are not conducive to a safe setup for our staff. Depending upon your location, we can do an on-site survey prior to the reservation to ensure it will fit. 402-578-4123 and ask for Brian.